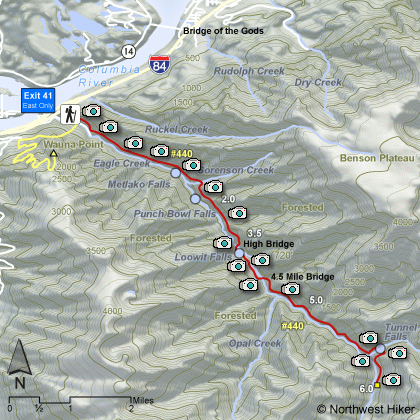 This is one of the most popular hikes in Oregon. After leaving the trail head, the hike almost immediately begins to climb the sheer rock walls of Eagle Creek. The builders placed cables to hold on to as the trail takes you past several very steep areas. 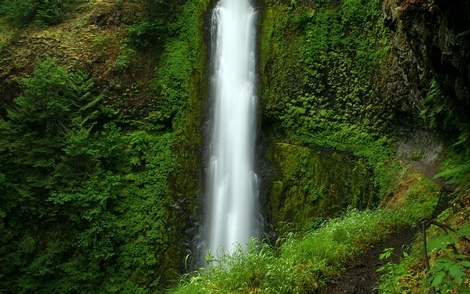 At 2 miles you will come to Punchbowl Falls, and at 3.2 miles you will reach the High Bridge. After crossing the High Bridge, the trail continues upstream for another 2.8 miles to the fantastic Tunnel Falls. So names because the trail builders decided to carve a tunnel out of the sheer rock wall, over which the falls descends, for hikers to pass by the falls. But there's more. If you walk a short distance past Tunnel Falls, you come to another treat, falls on Eagle Creek itself. Eagle Creek Trailhead: Traveling eastbound on I-84, take Exit #41. At the bottom of the ramp turn right. Go about 1/2 mile to the end of the road. You will go past a footbridge (that takes hikers up to Wauna Viewpoint) as the road narrows to one lane. Continue a short ways to a large parking lot; park only in designated spaces. NW Forest Pass required. Coming from the east, there is no westbound exit at Exit #41/Eagle Creek. You must continue on I-84 and get off at Exit #40/Bonneville Dam, get back on the interstate and head east for one mile to Exit #41. At the bottom of the ramp turn right. Go about 1/2 mile to the end of the road. You will go past a footbridge (that takes hikers up to Wauna Viewpoint) as the road narrows to one lane. Continue a short ways to a large parking lot; park only in designated spaces. NW Forest Pass required.